Reticulocytes are immature, anucleate erythrocytes which are released from bone marrow into the blood in increased numbers as a response to anemia caused by hemolysis (destruction) or loss (hemorrhage) of erythrocytes in most species (horses are a notable exception). Identification of reticulocytes allows assessment of whether bone marrow is responding to an anemia (given sufficient time) by increasing red blood cell (RBC) production; this is termed a regenerative response. Reticulocytes can be detected by virtue of the presence of RNA in the form of ribosomes and rough endoplasmic reticulum in their cytoplasm. The more immature the cell, the more RNA it contains. In contrast, mature red blood cells, which are no longer synthesizing hemoglobin, contain very small amounts or no RNA (they are essentially small sacs of hemoglobin). When immature red blood cells are stained with a supravital dye, the cytoplasmic RNA is precipitated into a reticulum-like network. Thus the term, reticulocyte, was coined. With these dyes, two types of reticulocytes are seen – those with big aggregates of RNA, which are also called aggregate reticulocytes and those with small dots of RNA, which are called punctate reticulocytes (see image to the right). Since cells with more RNA are younger, aggregate reticulocytes are more immature than punctate reticulocytes. In most species, this does not matter because both types of reticulocytes have similar half lives in the circulation, but in cats, aggregate reticulocytes only persist for 12-24 hours before they mature into punctate reticulocytes. Punctate reticulocytes can persist for several days (7-10 days usually) in this species. Since punctate reticulocytes last for a while in the circulation of cats, we only count aggregate reticulocytes when assessing whether the bone marrow is currently responding to an anemia in this species. Fluorescent dyes that bind to RNA (and DNA) can also be used to detect reticulocytes using laser-based technology. This is how reticulocytes are counted in dogs and cats at Cornell University with our hematology analyzer. A common dye used for this purpose is thiazole orange. Canine red blood cell scatterplots obtained from the ADVIA hematology analyzer. With the hematology analyzer used in Clinical Pathology (ADVIA 2120), reticulocytes are counted by staining blood a fluorescent dye (Oxazine 750). The immature red blood cells are then detected by the degree of fluorescence (mature erythrocytes will not fluoresce). We have validated this technique for the dog and cat. In addition, low numbers of reticulocytes can also be detected in the blood of horses with regenerative anemias due to experimental blood loss or after erythropoietin treatment (Cooper at al 2006). However, horses do not release sufficient reticulocytes for this to be clinically useful (there is a large overlap in the reticulocyte counts between non-anemic horses and horses with a regenerative anemia in our experience and in published data [Balan et al 2019]). 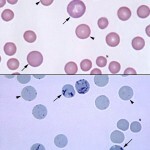 In other species, reticulocytes can be counted manually using a new methylene blue stain, although this is not done routinely. Depending on their RNA content, reticulocytes can be detected with routine Romanowsky-based polychrome stains (eg, Wright’s, DiffQuik) used for staining blood smears. RNA (or DNA) stains blue with these dyes, whereas hemoglobin stains red. When the immature red blood cells contain large amounts of RNA, the blue mixes with the hemoglobin to yield a purple color and the cells are termed polychromatophilic red blood cells. These polychromatophils correspond to aggregate reticulocytes. Thus, we can examine a blood smear for the presence of polychromasia to assess if the marrow is responding to an anemia in most species, other than the horse or equine species. Indeed, the proportion of polychromatophils can be used as a rough guide to estimate the reticulocyte count. In contrast to aggregate reticulocytes, punctate reticulocytes will stain red and not purple because they only contain small amounts of RNA (the hemoglobin dominates). Therefore, they are a lot harder to identify on a regular blood smear. Punctate reticulocytes can be larger than normal (until they are remodeled by splenic macrophages as they recirculate), i.e. they can be macrocytes, and may be detected on routine blood smears by their larger size. Unfortunately, there are other causes of large red blood cells so not all macrocytes are punctate reticulocytes and we do not rely on these cells to evaluate the regenerative response in most species (the horse is an exception). Reticulocytes are only quantified routinely as a percentage in dogs and cats. Results are interpreted with respect to the reference interval (dogs and cats have low numbers of reticulocytes in health). If the percentage is above the reference interval, the animal has a reticulocytosis and there is attempted bone marrow regeneration, however we do not know if this anemia is adequately regenerative or not, because the percentage alone does not take into account the severity is the anemia. To assess the adequacy of regeneration, we usually calculate and report an absolute reticulocyte count. There are additional formulae that can be used to quantify regeneration, including the corrected reticulocyte percentage and reticulocyte production index (these are found under the absolute reticulocyte count page as well as the page on assessing regeneration). 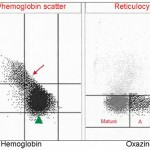 The latter two results are not usually provided on most hemograms, but can be calculated in-house from hemogram results.